Kuku is omelette gone coo-coo. It looks like nothing else in the world, but works amazingly well and this may become a staple approach to eggs for us. The recipe book says that kuku comes in many variations over the middle east, and as far as I can tell it is ordinary omelette but a) it is baked, b) it has a little spice in. The one here, is most definitely not ordinary omelette since it contains the most pure green – which is, in fact, spinach. Again, I strayed a little from the instructions (overspicing as I like to do) so I’ll give brief details. 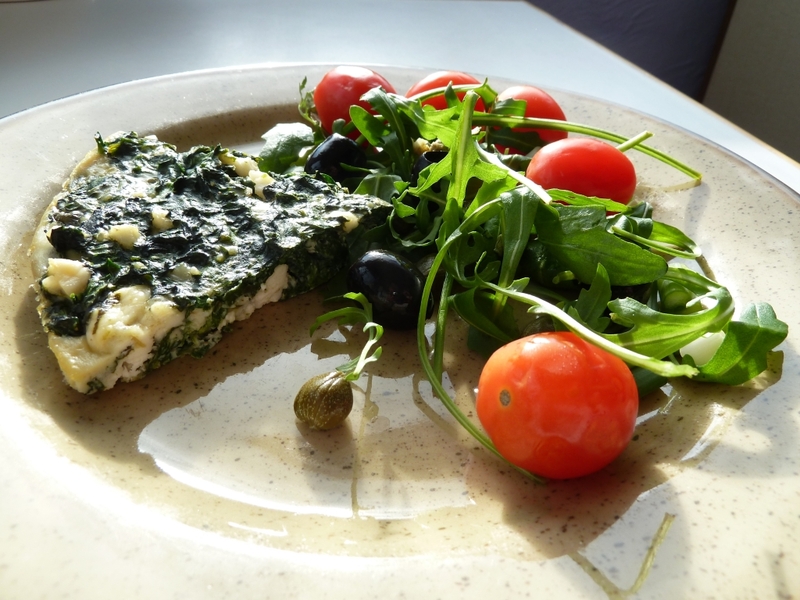 300g spinach, 3 eggs, 1 1/2 tablespoons chopped mint, 1 tsp ground cumin, 100g feta cheese. First, cook the spinach by placing it all into a large saucepan, alone, add a lid and put on a gentle heat. The leaves quickly shrivel up, and with a little stirring the whole thing reduces about 10 fold. Drain the spinach in a sieve or colander and squeeze out the extra water, then chop it up roughly. Break the eggs and mix them up, trying not to beat them. Add the spinach, chopped mint, crumbled feta cheese, cumin, salt and pepper to taste, then pour everything into a greased oven dish. Bake at 180 degrees celcius for 25-30 minutes until just set. The recipe book, no doubt following tradition, recommends serving this cold. We did try that the following day and it wasn’t at all bad, but personally I prefer it hot. The spinach forms an interesting base for the eggs, gently flavouring due to the long cooking time. The feta cheese gives it a tang missing from simple omelette, and the mint and cumin make for a very flavoursome and different dish – no doubt you can make up the herbs and spices as takes your fancy. Recipe: “The complete Vegetarian cookbook” by Sarah Brown, page 181. This pie is (broadly speaking!) 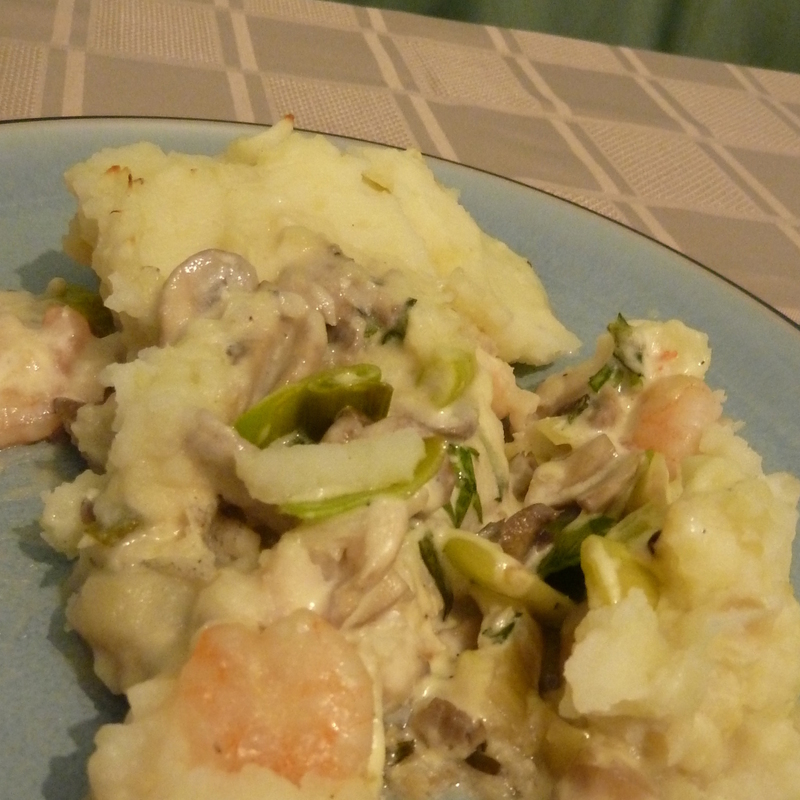 an adaptation of this fish pie. But it is also completely different, so I’ll give a fill recipe. Pie with pastry, as pie was meant to be. The meaties at the table tried a little of my pie and concluded they would be happy with it as a main, so this was a definite keeper. The halloumi is very salty but still has a delicate flavour, and everything benefits from being heated in the creamy sauce, soaking up a gentle richness not found in the veg alone. Chop up the halloumi into chunks and fry until golden on both sides. Then sauté the vegetables in more butter and pepper them to taste. Make the sauce by heating a knob of butter and adding the flour, mixing well to form a roux. Add the white wine and water slowly, stirring continuously, then add the cream. The sauce should be slightly thick, about the consistency of tomato ketchup – add more water if needed, then the herbs, and remove from the heat. Throw the lot into a heatproof dish, then roll out the pastry to fit and pop it on top, crimping the edges to make a firm fit and pierce the pastry with a fork. Then paint the pastry with either egg or milk and bake for 25-30 minutes at 180 degrees celcius – to prevent the pastry from burning (in our oven at least) it is best to cook the pie covered for the first 20 minutes. Oddly enough, I made the sauce a bit too thick this time, and also poured it on as a top layer. Although it did penetrate the pie, it also stuck a lot to the pastry, which made for a really interesting texture and taste. This might be a trick to remember for the future – perhaps coating the underside of pie pastry with sauce before baking. We will be trying something very similar to this in the future. Recipe: My own, but based on a heavily modified fishermans pie recipe from the link above. Anna made this fishy pie when friends were coming over – I had a different pie (details with recipe in the next post) based on the same idea. Despite our very poor presentation, this went down very well. 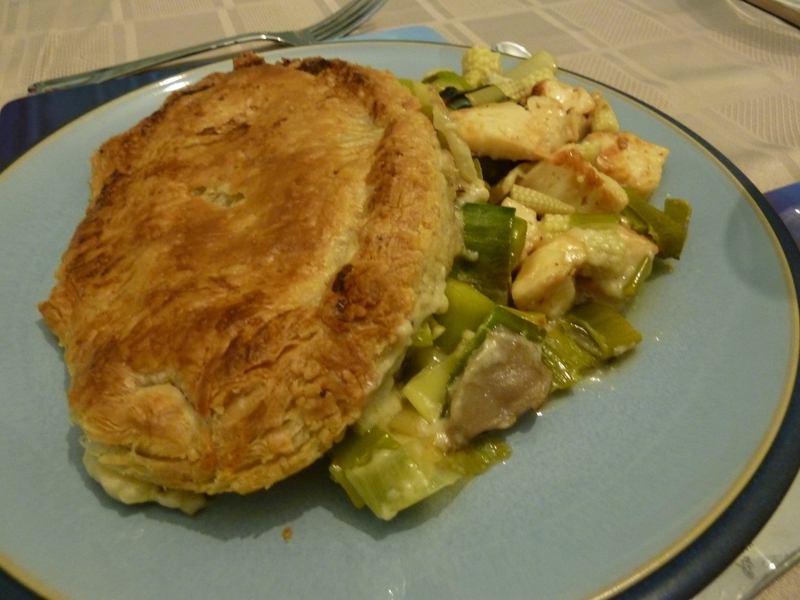 As usual with fish pie, it has a mash potato topping – in my mind a real waste of the opportunity to have pastry! Basically, you start by baking some white fish in white wine with a good scattering of tarragon on top. Whilst this cooks, sauté some mushrooms in butter (and boil the potatoes for mashing). Then make a white sauce by making a reux from flour and butter, adding the liquid from the fish and some cream. Then mix up everything with some prawns, add the potato on top and bake. The pie seemed to have a delicate flavour, and whilst in the dish looked very pleasant! A shame about the presentation, but flavour is what counts I suppose! Recipe: “The daily cook book” by Love Food, February 6th. 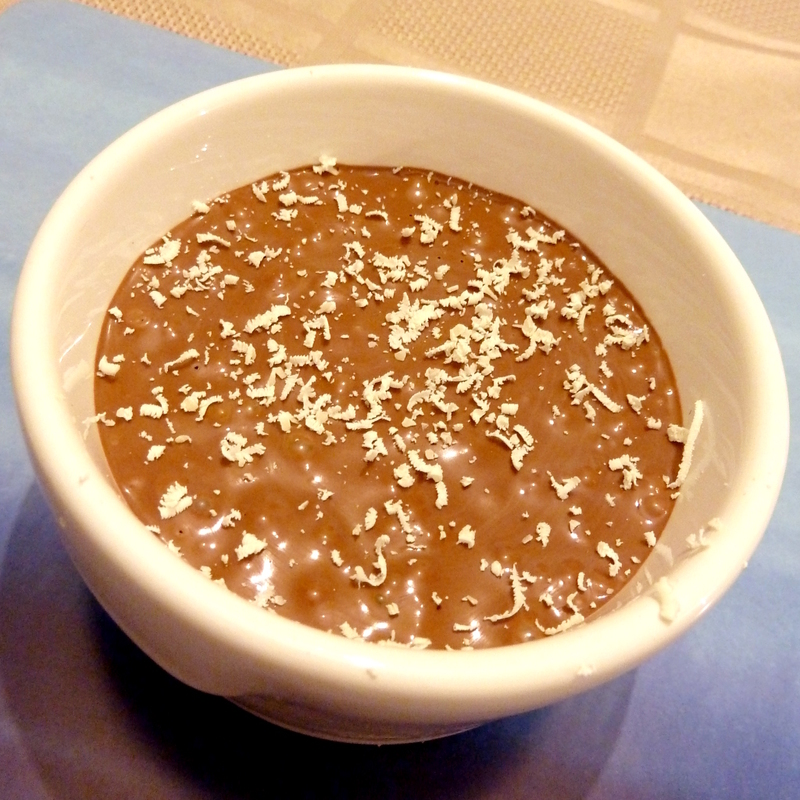 This rich mousse is really easy to make, and for the lover of rich, dark chocolate is a great pudding. Actually, for me this was a little rich. We used a rich, dark chocolate which is mixed in with (single!) cream, some raw egg and some Marsala. 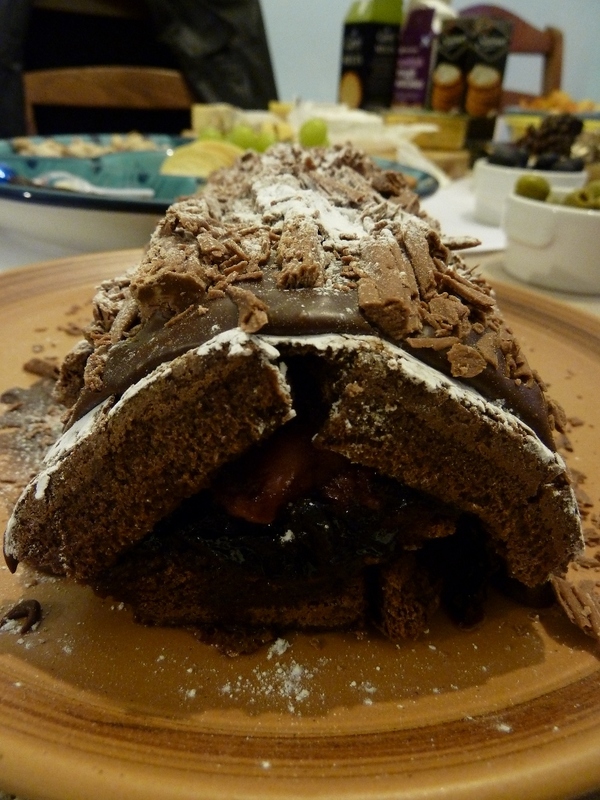 That is all that is in there – but somehow, it tastes richer than the chocolate that went in! Very strange. The egg doesn’t contribute to the flavour – it just makes it set in the fridge – and somehow the cream doesn’t take the edge off. I think dark chocolate lovers would like this a lot more than I did, and perhaps I’d prefer it with milk chocolate. But I do appreciate that there is no gelatine in it! Recipe: “The daily cook book” by Love Food, February 24th. and I cheated so much to get the least sad looking slice of cake I could. 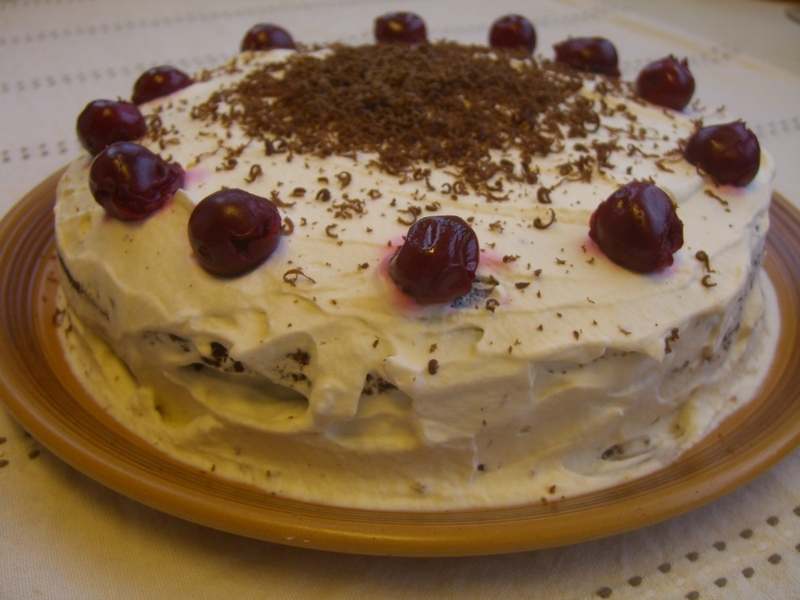 Even the cherries look like they’ve seen better days… all these problems came from me overwhipping the cream, which then wouldn’t spread over the cake properly and went grey when the cherrys were put on it. They taste the same though! 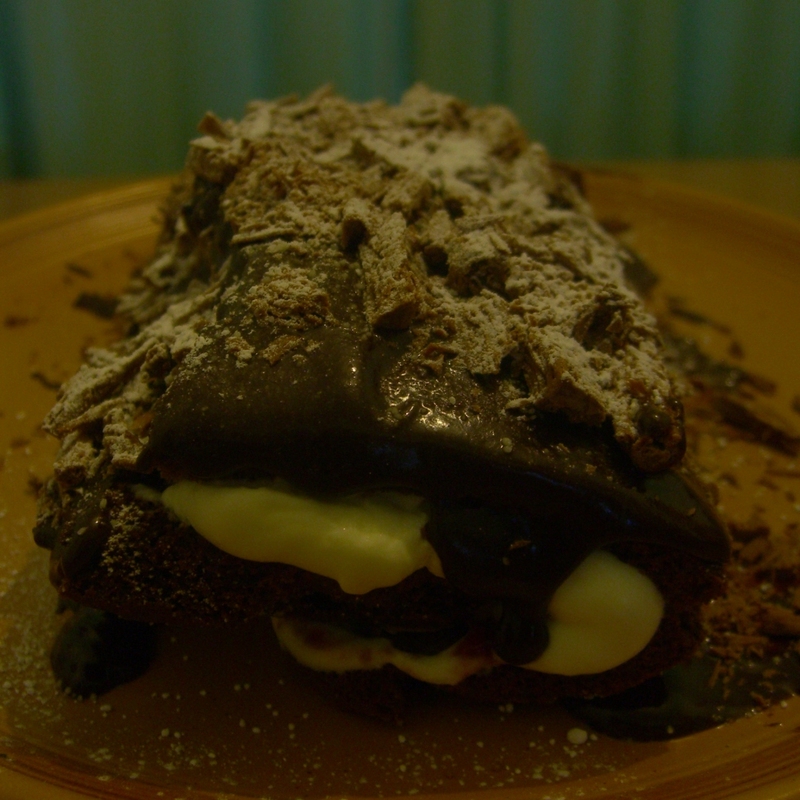 Chocolate Log with Cherry, New Years 2010-2011. 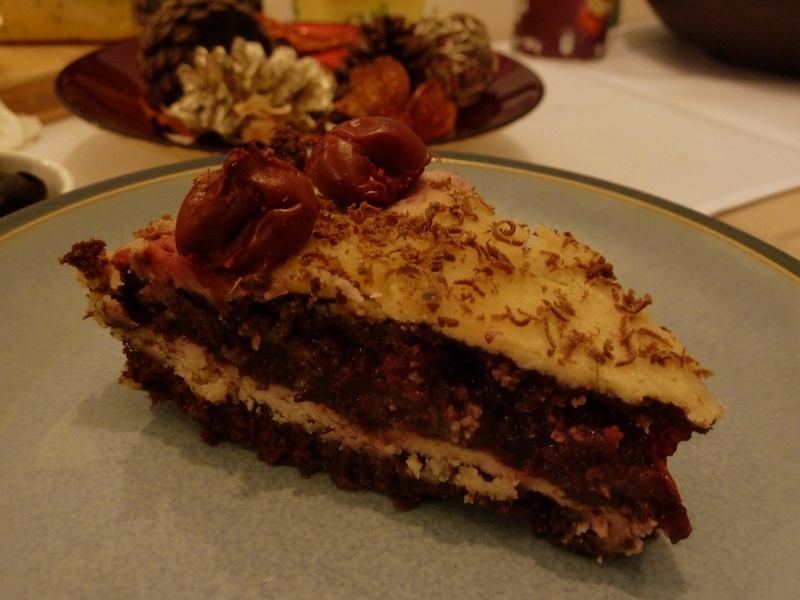 Both of these look right, the new one perhaps more so because Anna wouldn’t let me near the cream… This was a HUGE success: everybody ate way too much of the magic cherry creamy cakey chocolately goodness and sat there feeling full and happy for the rest of the evening.